Following the injection of mouse embryos with mRNA, nearly 25,000 multicolor and multilayer confocal images of the embryos were acquired over 60 hour period as they developed to the blastocysts stage.Thereafter, they were transferred to a recipient mouse that gave birth to healthy pups, each of which developed normally and had full reproductive capability.This is firm evidence that long-term, multi-dimensional confocal imaging with CV1000 causes no harm to a delicate specimen such as an early stage embryo. Mikiko Tokoro, Ph.D., Noritaka Fukunaga, Ph.D. and Yoshimasa Asada, M.D., Ph.D. at Asada Institute for Reproductive Medicine won an ART award in video section at the ASRM (American Society for Reproductive Medicine) held in Boston on Oct 12-17th, 2013. Interkinetic nuclear movement in the Cerebral cortex of chicken was observed for about 20 hours. Thanks to the real confocality and high-precision auto stage of the CV1000, it is possible to observe biological reactions in even thick specimen like tissue sections at a wide area with high resolution. Okamoto, M., Namba, T., Shinoda, T., Kondo, T., Watanabe, T., Inoue, Y., Takeuchi, K., Enomoto, Y., Ota, K., Oda, K., Wada, Y., Sagou, K., Saito, K., Sakakibara, A., Kawaguchi, A., Nakajima, K., Adachi, T., Fujimori, T., Ueda, M. Hayashi, S., Kaibuchi, K., Miyata, T.
Healthy cell division of HeLa cells expressing Fucci was recorded for nearly 7 days. By using incubator attachment, cells grew and divided as normally as being cultured in a CO2 incubator. 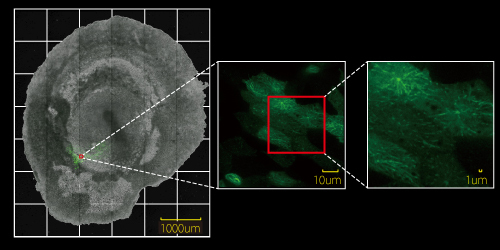 The process to form colonies of EG cells(a kind of iPS cell)from primordial germ cells expressing GFP of 12.5 days embryo of TG mouse was imaged for a long-time at the whole area of a culture dish(625fields). As a result of 5 days imaging, colonies of EG cells were formed as frequently as was formed when the cells were cultured in a CO2 incubator. With he CV1000, you can record whole area quite at ease when you don't know where to find the target, and can discover what happened from the acquired data. Data: Yasuhisa Matsui, PhD, Cell Resource Center, Institute of Development, Aging and Cancer, Tohoku University. Floating 293F cells were transfected with eGFP by using NeoFection, a transfection accelerating agent made by ASTEC.The cells were shake-cultured over night. 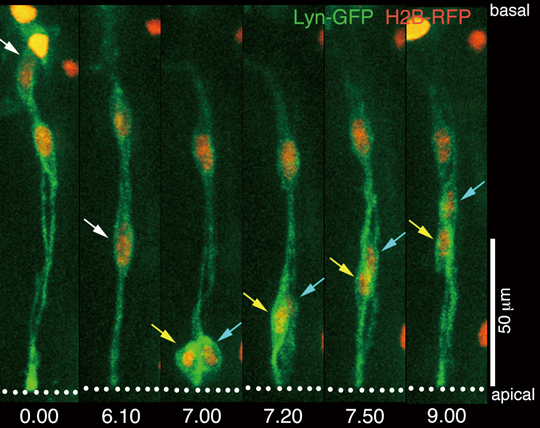 As a result of time lapse imaging, active movement of cells expressing eGFP inside the floating cell clusters, and structural changes in the cell wall such as ruffing were clearly observed. White blood cell movement in zebra fish tail was continuously recorded. By rapidly capturing Z-slice images, 3D Movement of live specimen can be tracked in multi-color and with high resolution. 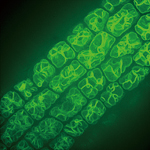 Changes in the shape of a vacuolar membrane during the germination process were continuously recorded. High-speed and multi-point time lapse imaging with the CV1000 allows accurate and high-resolution tracking of rapid changes in living organisms, something that has proven quite difficult with conventional imaging systems. By selecting the appropriate filter and pinhole size, thick samples and auto fluorescent plant cells can be clearly observed with the CV1000.